Debris containing a potentially toxic mineral was recently found on St John's Island, leading the authorities to seal off more than half of the island as a safety precaution. Traces of asbestos were detected on April 16 in construction debris such as roof tiles around the island's campsite, lagoon and holiday bungalow area, the Singapore Land Authority (SLA) said at a media briefing yesterday. Even though the risk of visitors developing asbestos-related diseases is low due to short-term exposure to the mineral, SLA said it took the precaution of cordoning off the affected areas the following day. SLA, which manages the island, also closed off the campsite and cancelled about a dozen bookings for the holiday bungalow. The two long-term residents on St John's Island, whose homes are within the affected areas, moved to the mainland last Wednesday. SLA said they were found to be in good health. Asbestos is a fibrous mineral that was once a popular component in construction materials. Due to its links to health problems such as lung cancer, its use in buildings was banned in Singapore in 1989, but many earlier structures still contain the substance. Structures containing asbestos pose no risk to humans if they are intact. However, when there is damage or disturbance - such as sawing and cutting - fibres may be released into the air and inhaled. In this case, the asbestos was found in construction debris such as roof tiles. SLA is investigating how the debris came to the island. Asbestos-related diseases such as lung cancer or asbestosis - the progressive scarring of the lungs - occur mainly in people who have continuous years of exposure to high levels of asbestos, said Associate Professor Loo Chian Min. The senior consultant for respiratory and critical care medicine at the Singapore General Hospital said casual visitors to St John's Island should not be unduly worried. However, for the two long-term islanders, Prof Loo said: "I would advise them to go for a baseline health check. "For asbestos to cause any illness, it would need 10 to 40 years before anything can happen. So a baseline would help to ascertain their health condition now, so there can be a comparison if anything should happen later." Dr Jim Teo, a respiratory physician at Parkway East Hospital, said the time and dosage of exposure could increase the risk of lung complications. While short-term exposure to high concentrations of asbestos in an enclosed space may be potentially harmful, it could also take years to show, he added. "Nowadays, exposure to asbestos is decreased... But asbestos was widely used decades ago and, as a result, we encounter cases only now," Dr Teo told The Straits Times. He said a detailed history of the patients' occupation and the materials they handled at work provide important clues to their past exposure to the toxic mineral. At yesterday's briefing, SLA said the affected areas will likely reopen only in the middle of next year, after asbestos removal and other construction works are completed. But visitors can still make the trip to the neighbouring Lazarus Island, which is connected to St John's Island by a bridge. The ferries from Marina South Pier to the island will also continue plying the route. Staff working at the two research facilities on the island - the Agri-Food and Veterinary Authority's aquaculture facility and the St John's Island National Marine Laboratory - can also continue to go to work, but will have to reach their laboratories via alternative routes. Even though official figures show that at least 200 asbestos-removal cases take place every year, the asbestos found on St John's Island is only the second prominent case. The first was in 2016, when SLA found that the corrugated roof sheets of terraced houses in Chip Bee Gardens had asbestos in some of them. In an update yesterday, SLA chief executive Tan Boon Khai said replacement works at Chip Bee are still ongoing. Ms Ria Tan, who documents the creatures found in Singapore's nature areas, including the lagoons on St John's Island, said the incident raised a few questions, including how the asbestos debris landed on the island. Ms Tan, who writes on the wildsingapore.com blog, said: "Going forward, how will the authorities ensure future proper disposal of general trash and industrial and construction waste?" Heritage blogger Jerome Lim said he is concerned that asbestos may be undetected in other areas. "In this case, the risk seems low due to the short-term exposure of users to the affected facilities on the island, but it may not be the case in other instances." 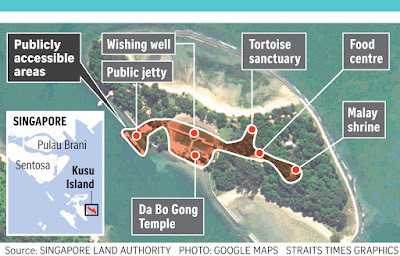 The beaches and lagoons around Kusu Island are closed to the public after pieces of debris containing asbestos were discovered, the Singapore Land Authority (SLA) said in a statement last evening. 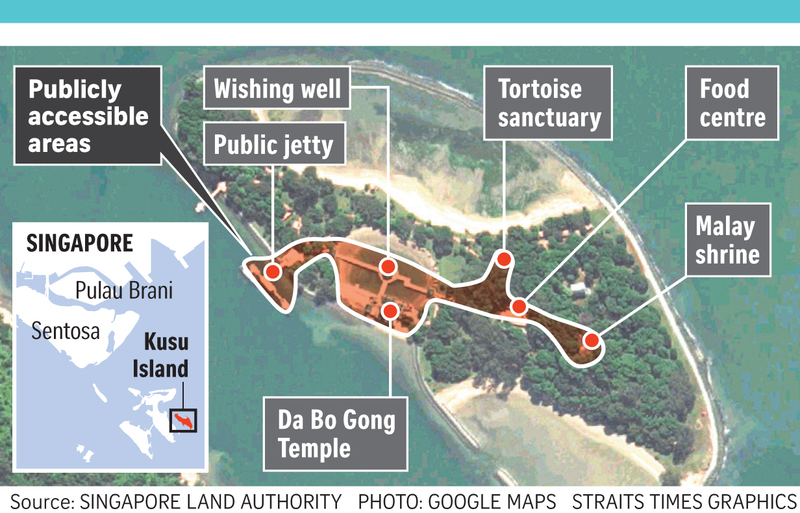 The potentially toxic material was, however, not detected at the island's other main public attractions like the Da Bo Gong (Tua Pek Kong) temple, wishing well, tortoise sanctuary, temporary hawker centre and jetty. These areas will remain open to visitors. Regular scheduled daily ferry services to the island will also continue. SLA said it will conduct asbestos removal works, which it expects to be done by October. The discovery of asbestos on Kusu follows checks by the SLA and other agencies after asbestos was found on St John's Island on April 16. Affected areas on St John's were also closed off and the SLA expects them to re-open only in mid-2019. Checks were also done on Lazarus Island, Pulau Seringat and Kias Island. They have been declared safe. Checks are still being done for Pulau Hantu. Asbestos is a fibrous mineral that was once a popular component in construction materials. Due to its links to health problems such as lung cancer, its use in buildings was banned in Singapore in 1989, but many earlier structures still contain the substance. Asbestos-related diseases such as asbestosis occur mainly in people with many years of continued exposure to high levels of asbestos, and this is commonly work-related. The risk of developing an asbestos-related disease for persons with incidental exposure, including visitors to affected islands, is low.